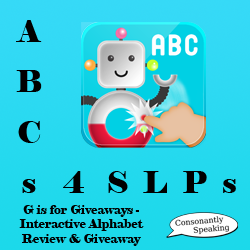 Tired of teaching ABCs with flashcards and repeating letters over and over again? Pi'ikea Street has the solution to your problem with its innovative alphabet application that is perfect for infants, toddlers, and Kindergarteners alike! Each letter of the alphabet is stated aloud and written as its letter name, phonetic pronunciation, with a word, and an interactive, animated image to match the word. 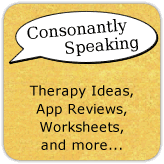 Continue reading my review of the application to learn about how you can use this application with young children in speech-language therapy as well as to enter a giveaway for the application! The main page shows each letter of the alphabet as a colorful capital letter along with four other options. These additional options are pressing and holding over the baby icon for "Baby Mode" (where the cards automatically advance), pressing the ABC letters with a music note three times to hear the alphabet song (sung by children and a robot), pressing the orange musical note button to change the music in the background of the application (3 different options or turn off the music), and pressing and holding the "i" button for more information. You can view a video of the application below to see the interactivity in action! This page of the application shows other games by Pi'ikea Street. If you do not have one of the applications on your iPad, you will be sent to its iTunes App Store page. If you do have the application already installed, you can press the image of the application and it will open that application. On this page at the top, you can also press buttons to review the application on the App Store, e-mail Pi'ikea Street questions or suggestions, visit their website, or follow them on social media. Pi'ikea Street's website includes coloring pages, a coloring contest (to possibly win an iPod Touch), crafts, news, things kids say, a shop for Pi'ikea gear, and a blog. Press on any letter. The application will then show an image of a word with the same beginning letter. The narrator will then read the text on the image ("[Letter] is for [word starting with that letter]." The words will pop up as each word is stated. Then, the phonetic pronunciation of the letter will be stated along with the word one more time. A child can hear the word and letter stated again by pressing on either one. Each image on the application associated with the letter is interactive. 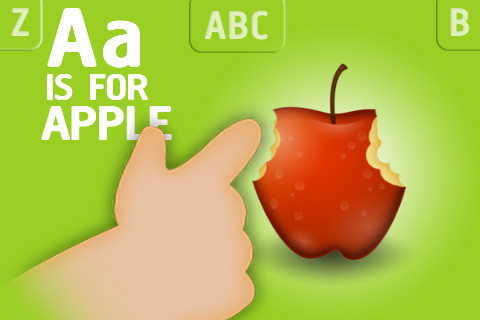 For example, for the letter A, A is for Apple and when the apple is pressed, a chomping sound will play along with part of the apple having a bite taken out of it. Some of the letter pages have more than one interactive element. For example, B is for Beach has the interactive elements of dragging the sun up and down on the horizon as well as building a sand castle. 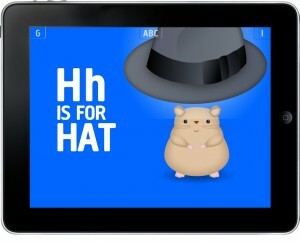 Some of the letter pages have more than one word, such as H is for Hat and when you lift up the hat, H is for Hamster with a hamster underneath it! Once a child is done with a letter, he or she can press the previous letter at the top left hand side of the page or the next letter at the top right hand side of the page. The child also has the option of returning to the list of all of the letters by pressing the "ABC" button in the middle of the top of the page. The application can be used for letter identification, letter sounds, and initial sounds in words! I love that there is text as well as a narrator reading the letters/words aloud! In addition, the fact that there are upper and lowercase letters is great for children to learn as well! The sounds and visuals in the application are appealing to young students, easy to see on the backgrounds, clear sound-wise, and large enough to see/read. This is great for students with hearing or vision difficulties. Images and sounds are not too overwhelming or cluttered which is great for those with sensory difficulties. Music is adjustable on the main page if it is distracting. In addition, the interactivity of this application may be calming to some students. This application is easy to use where children can press letters and begin playing! There is not much to teach in regards to application play. However, parents can still adjust settings on the Main Page by pressing and holding certain buttons. Some of the letters have two words to go with them while others do not. It would be great to have more words without impacting the simplicity of the application or to make each page similar. It would be great to have the option in the settings to have the letters on the Main Page be in uppercase, lowercase, or both! RtI - Use the application to teach children about letter sounds, letter identification, letter names, beginning letter sounds, and uppercase/lowercase letters. Students can even write letters using the Q is for Quill page! Articulation - Have the child find his or her speech sound(s) that he or she is working on, listen to the phonetic pronunciation and see if he or she can match it at the phoneme level. Have the child state the word(s) that go(es) with his or her speech sound(s) and compare to the pronunciation on the application. Have the child use the word(s) associated with his or her speech sound(s) in a sentence or a story. Have students think of as many words as they can for their speech sound's letter. Auditory Bombardment - Press the letters over and over again to hear the letter name and sound stated by the narrator. Press the word to hear it stated by the narrator. Expressive Language - Have the child create a sentence using the word associated with the letter. Have the child create a story about the image shown. Discuss the action words associated with the interactive aspects of the scenes ("build" a castle, "blow out" the candles, "crack" the egg, etc.) while pressing on the images and watching the animations. Some of the letters have more than one object (two eggs, three geese babies, four letters, a pile of noodles, etc.) where plural words (regular and irregular) can be discussed. Children can even write a sentence or draw a picture to talk about using the Q is for Quill page! Receptive Language - Children will learn different vocabulary by playing the application. 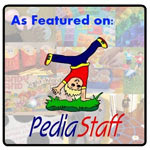 Have children describe the different words, their colors, what they do, shapes, sizes, etc. Use the application for students to follow one-step directions ("crack the egg", "write the letter A", "close the umbrella", "play a song on the xylophone", etc.). Have children think of as many words as they can that start with a given letter. Memory - Play through a couple letters, then see if the child can remember what word went with each letter. Press on the letter on the Main Page to see if he or she answered correctly. Social Skills - Have students talk about their favorite letter. Discuss the first letter of each person's name and how to spell it. Have students talk about their favorite interactive element of the application with each other. 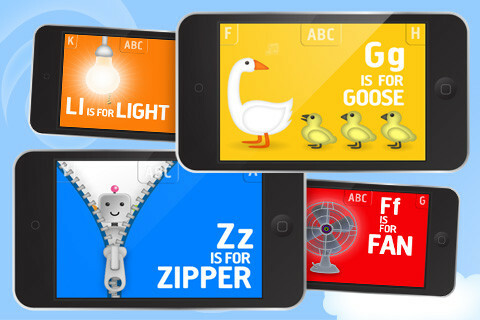 Interactive Alphabet is available for the iPod Touch, iPhone, and iPad for $2.99! Consonantly Speaking was given three codes to give away for this event by Pi'ikea Street along with the review. No other form of compensation was received. Enter the giveaway below for your chance to win one of three codes for this application!